I love reading Rabbi Sacks and I’m currently in the middle of reading (for the billionth time) the Genesis/Exodus section of the Bible (the billionth reading is what happens when you keep starting a “Read the Entire Bible in a Year” plan and don’t finish it and then start it again and don’t finish it and #rinserepeat). This means I’m currently flooded with Jewish stories about how God shows Himself to His people. He didn’t want future generations to forget how He had worked on their behalf so He told them to keep telling His story. The sermon landed on my heart. I knew it would take a minute, but we would find a home. I had faith God would provide our Rehoboth. I heard this sermon while pregnant and living with my in-laws. Mark’s biggest apprehension about moving out was that we couldn’t afford to buy a place which meant we’d have to rent which made his skin crawl because of ‘throwing away money’ and all of that. We decided to look for a house we could afford, and worked with the Mr. Magoo of realtors (meaning he had no clue what he was doing). Amazingly, we found a house! In our budget! Close to our families! The house had plenty of work that needed to be done, but it really was perfect. Mark’s only big remodel dream was to tear out one of the walls in the upstairs bedroom so that it could look into the downstairs. Basically, make it a loft. True story? I thought it was a dumb idea and figured it could be one of those projects that hung out at the bottom of the to-do list. Forever. Well, Mr. Magoo was an adorable cartoon, but a horrible realtor. The whole thing fell through and we were 1 month away from a baby. Time was running out. Lots of arguments conversations later and Mark found us a decently sized apartment within our budget. We moved in and a week later my water broke. Otis was on his way. We spent a lovely and hard year in that apartment. Mark did the stay-at-home-dad thing and, like most sahp, he felt lonely and an apartment that never felt homey didn’t help that feeling. By December of 2011 I knew God was telling me that we were going to buy a home. It didn’t make any sense to me because I was making $13.28 an hour. Picture or it didn’t happen? And you don’t exactly have a down payment sized savings when you’re living on less than what Bernie thinks is acceptable. But I emailed our amazing realtor, Tim, anyways because faith and that whole story about turning fish and loaves into plenty. With our mortgage lady’s help we found a mortgage for poor people that was like, “If you have a great rental history then we can give you a mortgage with some insanely low amount as a down payment.” Ah! Look at that! We had great rental history BECAUSE WE LEFT MARK’S PARENTS’ HOUSE ONE YEAR AGO! I like to thank my stubborn nagging for that assist. We were now given the fun assignment of finding a house that cost less than $115,000, was close to our parents, and wouldn’t need too many repairs because nobody wanted to lend us money for a fixer upper because they’d seen our finances… we had no money for a fixer upper. We put an offer on a house that was beyond perfect. Huge with a fenced in yard and in my in-law’s neighborhood. I loved it so much. I still get sad thinking about it. 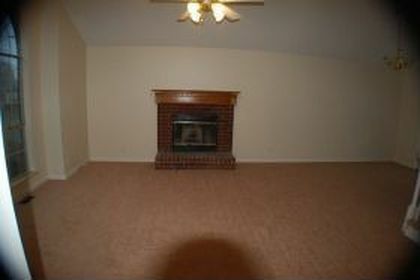 It was a weird property with a weird bidding thing, and we didn’t get it. We put another offer in a few weeks later. Another weird bank-owned property. It was a cute house in a cute neighborhood. I believed so much that this was our house that my mom, Otis, and I drove out there after we put the offer in so I could show her our new place. I drove there one morning before I went to work so that I could get an idea of what the commute would be like. The bank ended up not accepting the offer because it was tied to some other properties and they wanted to sell them all together or something like that. We didn’t get it. That house was one we had seen a month before. It was a bank owned property that was listed at $115,000. I had loved it (but let’s be real, at this point I kind of loved every house that seemed like it could be The One). I remember standing inside while Mark and Tim looked around outside. I was standing on the brick in front of the fireplace and looking out the big window into the front yard. The fireplace where I knew God said this was our home. And then Mark and Tim walked back in. But here I was, a month later, hearing God say to go back to that house. What was really weird was that it had been taken off the market since we’d seen it (I had every house listed under $115,000 in the Southeast Nashville area memorized) so I wasn’t really sure where this would lead. We drove to that house and saw a man standing in the front yard writing on a clipboard. Mark parked and got out to talk to him. He came back to tell me about the conversation. Tim got the ball rolling and we put in an offer for $95,000 because why not? To our surprise, they accepted! We did appraisals and home inspections and no one ever talked about the siding which Mark and his dad ended up fixing the next summer. The closing took forever because banks are slow. We ended up spending a lovely 2 months with my in-laws while we waited to close on our new home. My favorite part of the story is that the house we bought has the exact same layout as the one we wanted right before I had Otis, the one with the Mr. Magoo realtor. The exact same floor plan, except there’s one difference: The bedroom that Mark wanted to turn into a loft in the first house was already a loft in that house. In our house. I like to think of that loft room as a little wink from God. So yes, Otis, the house you grew up in was given to us by God. He moved us to buy a house even though we were making $13/hour with no savings. And we built a lot of wells trying to find a place to call home, but then He called us back to that house at the exact same time that the new realtor was there so that we’d be the very first offer. And He’d guided us to rent even though it made no sense so that we could have a rental history to get the mortgage. And He gave us the house we had wanted from day one except better and completely perfect (at least in your dad’s eyes #ha). He gave us our Rehoboth, an open space for you and us to prosper. Otis, when you wonder if you should follow the Holy Spirit’s promptings please remember where you grew up. Remember that God, not us, provided a home for you, and that He’s been your shelter from the very beginning. Please remember that when life is chaotic to get as quiet as you possibly can and listen for His still, small voice. I sure do love you!